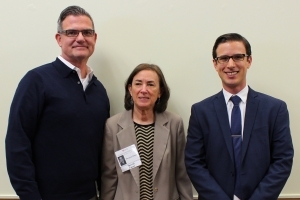 Modrall Sperling Shareholders Stan Harris and Marjorie Rogers share time with this year’s Sperling Scholarship recipient, Paul Roybal. The University of New Mexico School of Law hosted its annual Scholarship Luncheon, during which donors met the recipients whose educations they have supported. Several Modrall Sperling shareholders were able to meet this year’s recipient of the James E. Sperling Memorial Scholarship, Paul Roybal. Currently in his third year of law school, Paul attended the Rocky Mountain Mineral Law Foundation’s Annual Institute in Victoria, where Walter Stern, the firm’s President, was his mentor.